I have a thing for eggplant. Baba ganoush is quickly becoming my favorite dip, eggplant dishes are the first thing I order at Mediterranean restaurants, and Eggplant Parmesan is basically my love language. 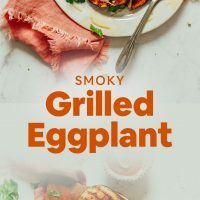 Yet I have neglected to share a recipe for eggplant in its simplest form: grilled – which is, perhaps, the quickest and most flavorful ways to prepare it. Shall we? This recipe requires just 9 ingredients and 20 minutes to prepare. The first step it to cover the eggplant in some coconut aminos (or tamari) and a little oil to infuse flavor and prevent sticking when grilled. Then comes the spice blend! I favor smoky flavors like cumin, paprika, and cayenne for eggplant. Coriander adds a little herbal quality, while salt and garlic powder add a kick of flavor. Once it’s well seasoned, all that’s left to do is grill. I prefer a grill pan for ease, but an actual grill is the real deal and provides better flavor. 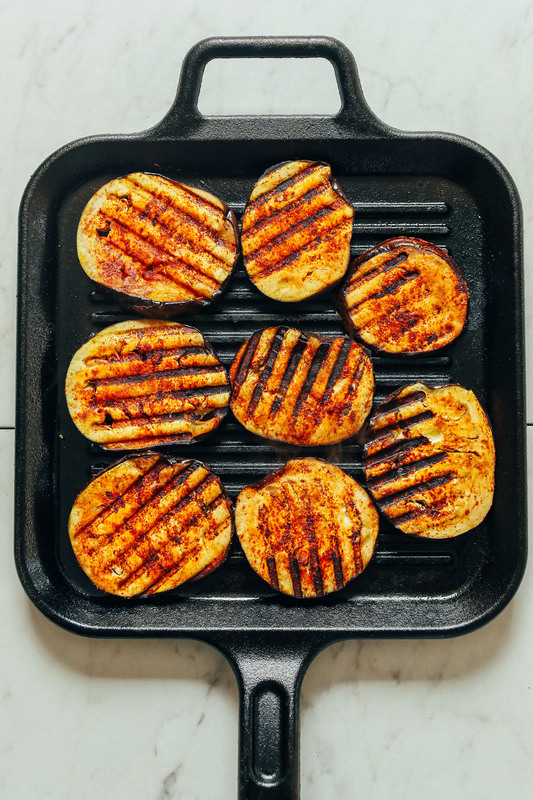 I like placing something heavy on top of the eggplant while grilling – like a cast-iron skillet – to press the eggplant into the grill to get more pronounced grill marks. This would make the perfect appetizer or side to practically anything Mediterranean-inspired. We love adding it to dishes like our Traditional Vegan Falafel, Greek Goddess Bowl, Ultimate Mediterranean Bowl, Garlicky Kale Salad with Crispy Chickpeas, and Chickpea Shawarma Wrap. Into eggplant? Also check out our Cashew-Less Vegan Queso, Moroccan Lentil-Stuffed Eggplant, Sesame Eggplant Tofu Bowls, and Smoky Harissa Eggplant Dip! 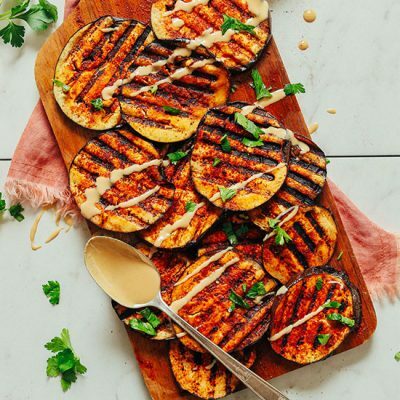 20-minute grilled eggplant seasoned with smoky spices, infused with coconut aminos for extra flavor, and grilled to perfection. The perfect flavorful side! Slice the eggplant into 1/4-inch rounds and place on a baking sheet. 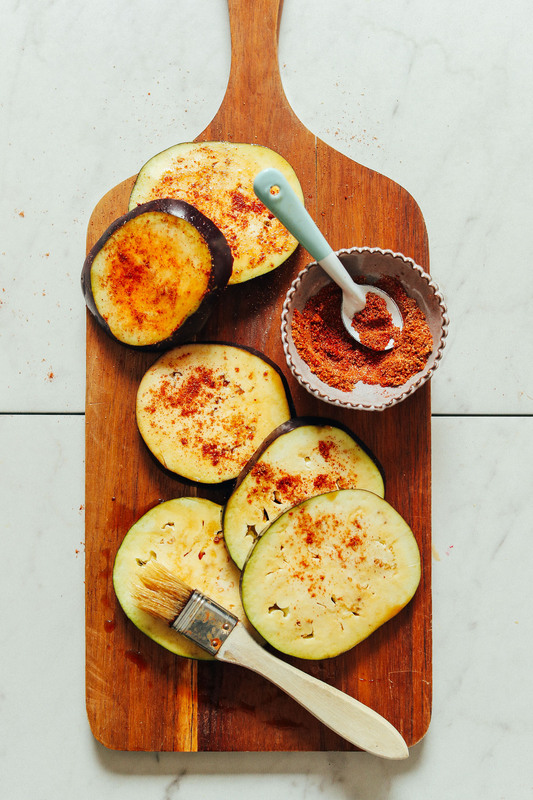 Drizzle the coconut aminos and half the oil over eggplant and use a brush or your hands to massage into the eggplant. The oil helps prevent sticking while grilling, and the coconut aminos infuses flavor. Add all the spices to a small dish and mix to combine. Then sprinkle over both sides of the eggplant and use your fingers to spread it around so it's well coated. Heat a grill or grill pan over medium-high heat. Once hot, brush the grill surface with a little oil to further prevent sticking. Then add eggplant. 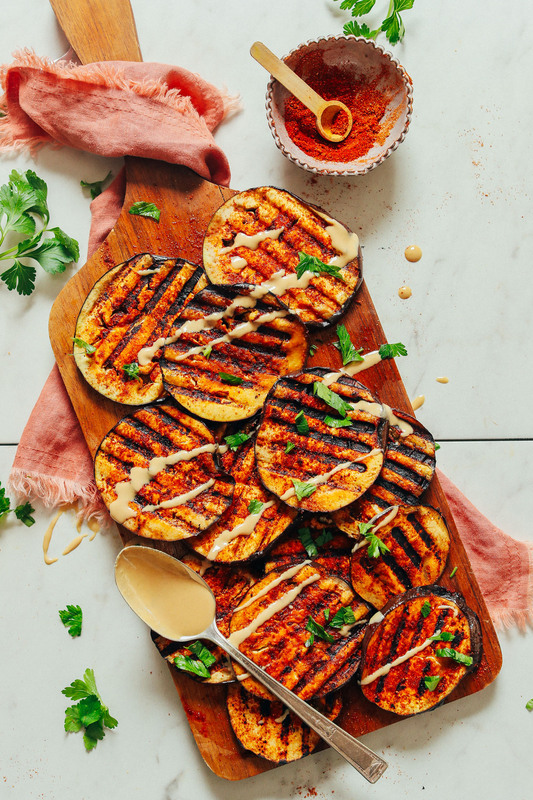 It can be helpful to place something heavy on top of the eggplant while it's grilling (like a cast-iron pan or heavy plate) to impress the eggplant into the grooves of the grill to make more pronounced grill marks. Grill on both sides for about 3 minutes or until the eggplant becomes a little tender and grill marks are pronounced. Plate the eggplant and enjoy as is or garnish with tahini, garlic dill sauce, fresh herbs, or a little olive oil. This is delicious on its own, but I especially enjoy it with hummus, in a Mediterranean-themed bowl, or in a salad. Best when fresh, though leftovers can be stored in the refrigerator up to 3 days. Reheat in a cast-iron pan over medium heat until hot. *Nutrition information is a rough estimate calculated with lesser amount of avocado oil and without optional ingredients. Great idea and very tasty. I used my “old” George Foreman grill. We made this both on a bbq outside and on our George Foreman grill. Both were fantastic, this is my new favorite! Absolutely delicious! I made this for a party and it was a real crowd pleaser with the garlic dill sauce. Next time, I may omit the cumin (I’m personally not a huge fan) and peel the eggplant before slicing it (the skin was a little thick) but overall it was so simple and the flavors were incredible! I just made this. It is absolutely delicious. I grilled the eggplant on my George Foreman grill for just a few minutes. The only thing that I changed was using tahini to make the dill dressing. The spices were fantastic. Please try it! When you say “Grill on both sides for about 3 minutes”…, is that 3 minutes per side or 3 minutes total? I was an eggplant hater as a child and am in “recovery” now. I want to make this because it honors the eggplant rather than hiding it under a blanket of cheese with sauce on top. I’ve never eggplant — excited to try it! 3 minutes per side, yes! Yay! If you could leave a star rating next time, that would help us a lot! We made this as a side to a hearty mushroom stroganoff and it was fantastic! We grilled them on our little outdoor grill and they came out beautifully. The seasonings are so robust without being too much. We will definitely be making this again and again! Will I get good results if I do it on the barbecue? Dana I share your love of all things eggplant. I actually use a few of your recipes to make a delicious(but Frankenstein) eggplant parm bake. 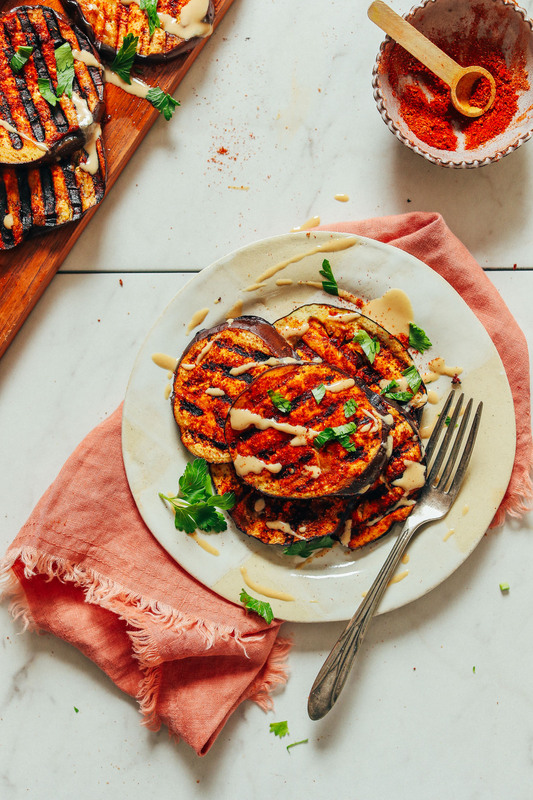 I layer my seasoned eggplant slices with arrabbiata sauce and a layer of your tofu ricotta that I mix with either raw zucchini noodles or spaghetti squash! It’s like eggplant parm meets a baked pasta. Delish. Smart! Thanks for sharing, Rebecca! I LOVE grilled eggplant, it’s delicious! The way you smoked it and marinaded it is absolutely superb. I’ve yet to use avocado oil in cooking–I tried it on popcorn and it adds the most delicious and decadent savory undertone to it! We have successfully grilled eggplant on our George Forman grill. This seasoning sounds great. I’ll leave out the cumin though. For some reason it tastes like dirt to me. That is a great idea. I have some extra eggplant but don’t have a grill or grill pan, so I’ll try it on the George Foreman grill. Thanks so much! Absolutely love grilled eggplant!! Trying this recipe super soon.